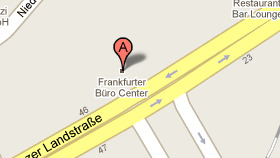 In the Business Center Eschborn, small offices for one person as well as open plan offices are at your disposal. 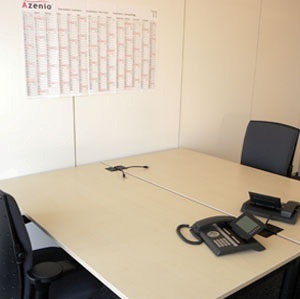 Your office and working place is completely furnished and equipped. Your office is ecologically air-conditioned and furnished with ergonomic office furniture for your well-being and equipped with powerful CAT-cabling and modern indirect lighting. The offices at Business Center are provided with a high-end IT-Network that leaves nothing to be desired. Virtual LAN, wireless LAN and two telephone lines per office are standard items as well as the usage of your own server or IT-video conference systems via our intelligent network systems. Your office is at your disposal 24/7. Each office can be individually locked and we provide an electronic security system. The offices are cleaned every day by our own cleaning staff. The accessory charges are included in the contract prices and there are no invoices. The Office Center is perfectly located in an excellent and popular business area with a beautiful view of the Frankfurt Skyline and the Taunus mountains, situated in one of the newest and most modern buildings in Eschborn. In the summer-time you can spend your break on the terrace and enjoy the fresh air of the Taunus. Restaurants, hotels, and other shops are located nearby.